– the art of the Japanese short staff and the Japanese sword. At ASBK we host a small group of individuals who train in the classical Japanese martial art of Shinto Muso Ryu Jo*. 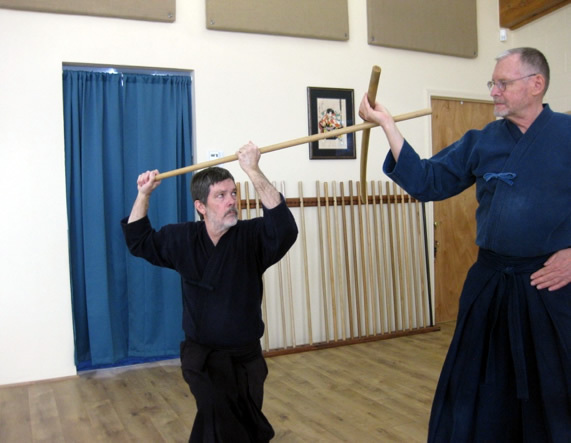 This martial art, referred to as jo, jodo, or jojutsu, is centered around the use of the Japanese sword and the Japanese short staff – a round stick just under an inch in diameter and about 50” in length. Often called “The Way of the Staff” or “The Way of the Stick,” this martial art was created with the purpose of defeating a swordsman in combat using the jo, with an emphasis on proper distance, timing, and precision. Shinto Muso Ryu Jo is a koryu budo, or bujutsu, (old school martial art) and falls under the grouping of older, classical Japanese martial arts originating when Japan was still a feudal society – an era that ended with the Meiji Restoration in 1868. This school was founded sometime around 1605 by Muso Gonnosuke Katsuyoshi, a warrior of the Tenshin Shoden Katori Shinto Ryu and Kashima Jikishinkage Shinto Ryu. 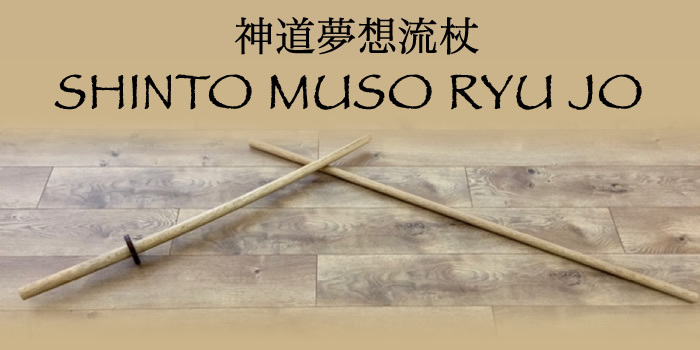 Training in Shinto Muso Ryu Jo is based on paired kata (prearranged forms) with one partner wielding the jo and the other a wooden practice sword (bokken or bokuto). In all, there are 64 kata in the curriculum. Training is systematic and develops the practitioner’s technical skills and mental focus, with emphasis on correct body movements, footwork, weapons handling, and the proper use of timing, targeting, and distancing. Training in jo begins by learning a set of twelve basic techniques (kihon), which contain all of the style's essential movements, followed by a systematic progression through the 64 kata. 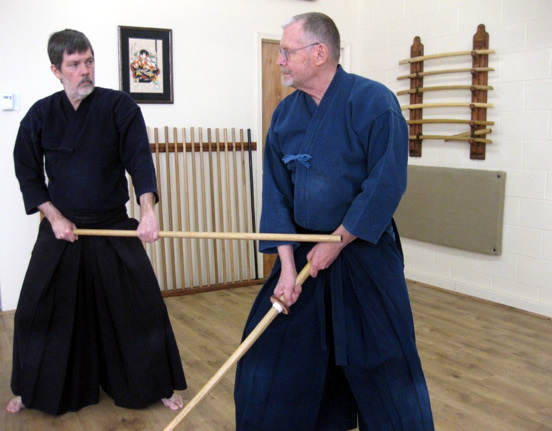 In addition to jojutsu and kenjutsu, the Shinto Muso Ryu Jo system also contains the assimilated arts of Uchida-ryu tanjojutsu (cane), Ikkaku-ryu juttejutsu (truncheon), and Isshin-ryu kusarigama-jutsu (chain and sickle). We train under the auspices of Phil Relnick Sensei, menkyo kaiden, and travel regularly to his Shintokan Dojo in Woodinville, WA (shinto-muso-ryu.org). We also work closely with the Shobukan Dojo in Denver, CO (shobukandojo.org). To learn more about Shinto Muso Ryu Jo, please visit the Shobukan Dojo website above. If you are interested in visiting a training session at ASBK Dojo, please contact Walt Hansen at smrmist@gmail.com, or Ralph Bryan at asbkdojo@msn.com. We generally train on Sunday or Saturday afternoons from 1:30 pm to 3:30 pm. * Shinto Muso Ryu Jodo (“SMR”) is not to be confused with the kata and other jo techniques taught within the Shin-Budo Kai Aikido curriculum – the latter are referred to as aiki-jo and are a compendium of techniques devised, and handed down, by Morihei Ueshiba, O Sensei, the founder of aikido, and his direct disciples. Likewise, SMR, being a koryu, is distinct from the system of jodo taught within the Zen Nihon Ken Renmei organization (“ZNKR”). 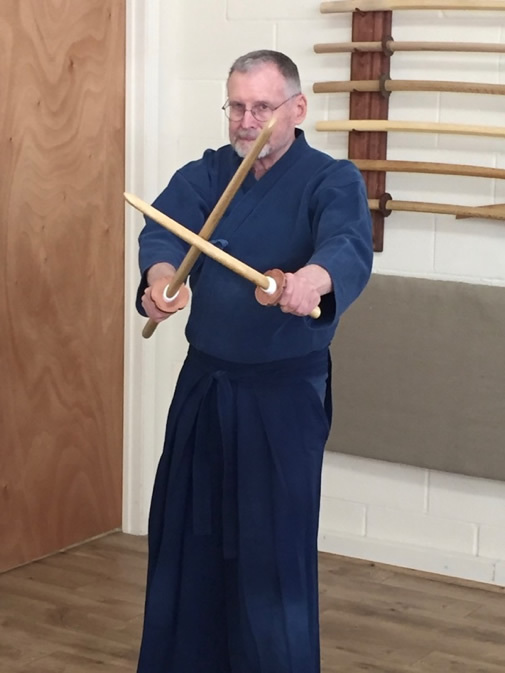 ZNKR jodo consists of the kihon techniques and seitei kata only, and these techniques were modified/modernized by Shimizu Takaji Sensei for use by ZNKR practitioners. 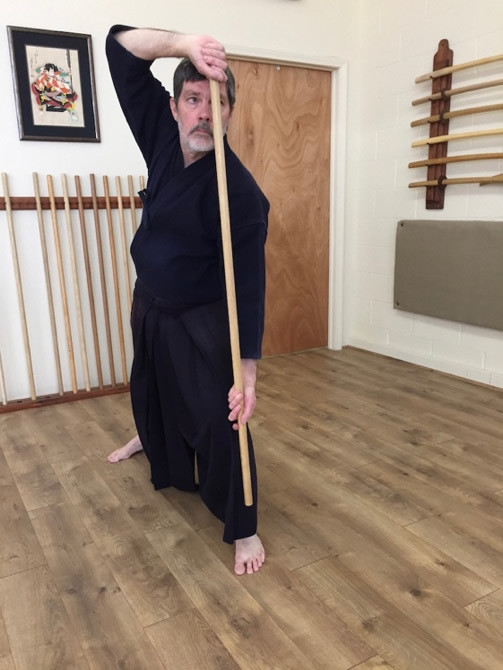 Within the Shin-Budo Kai jodo curriculum, we also practice kihon and seitei kata that are essentially the same as those practiced within ZNKR. We are not, however, a part of ZNKR and do not offer jodo specific rankings of any sort.